Here at BAM we pride ourselves on working closely together as a strong and effective team. Our ethos is centred around the value of every individual within BAM, without whom we would not be as successful as we are. Each member is actively encouraged to be innovative and use their own initiative whilst working amongst a talented and dedicated team. We are proud to have repeatedly won awards for our employee engagement including being ranked 4th in the UK Great Place to work award and the official Best Place to Work in the local Business Awards. Our accomplishments are a result of having a highly knowledgeable, fully engaged employees driving that success. Our work hard, play hard attitude means we are professional but relaxed, driven but supportive and we operate with integrity at the heart of what we do. We are always on the look out for talented individuals to join our community. 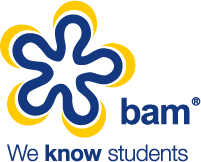 If you think you have what it takes and are interested in working at BAM then please get in touch. We are always interested in meeting talented and enthusiastic people!